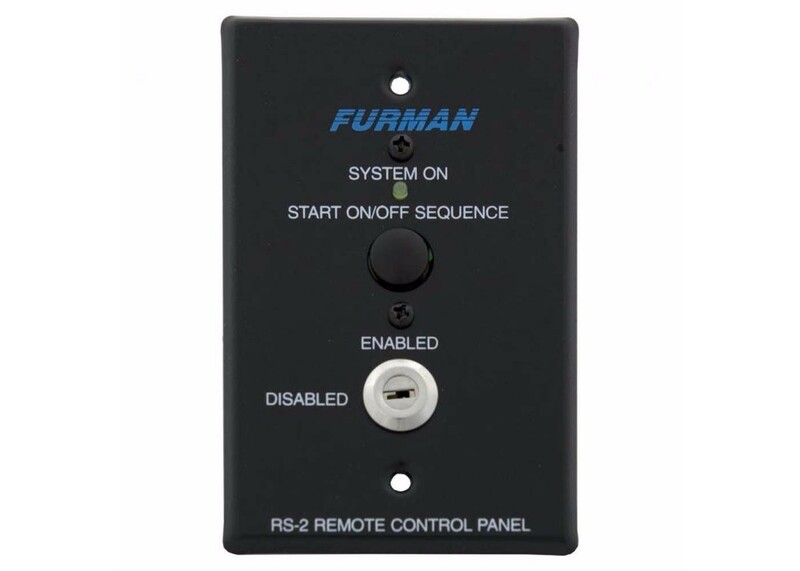 The RS-2 Remote System Control Panel provides a simple way to control AC equipment from one or more locations, using only inexpensive, low-voltage wiring.The panel can be easily installed in a single gang switchbox with a minimum depth of 1.5”. Features include a locking key switch and a ”System On” indicator LED. The RS-2 includes a momentary 'Start ON/OFF Sequence' push-button. The rear of the panel has a circuit board with a full size barrier strip for field wiring connections.The RS-2 can be used to control the Furman ASD-120 Sequenced Power Distributor, the Power Link, Power Port, Remote AC Controller, the MiniPort Power Relay series, or the PS-8R, PS-8R II or PS-PRO II Power Sequencers, as well as other equipment that needs a switch contact at a remote location. The RS-2 Remote System Control Panel is identical to the RS-1 in most respects, but with a momentary function rather that maintained. The key switch offers an enable/disable function.The RS-2 can control multiple power products by wiring their control inputs in parallel. The RS-2 is ideal for installations requiring multiple remote switches. For installations requiring only one remote maintained contact switch, we recommend the RS-1. The RS-2 may also be compatible with other AC power distribution and sequencing products. Our Technical Support team will be happy to advise you on your specific installation needs. Dimensions : 4.75” (H) x 2.75” (W) x 1.25” (D).Finish : black epoxy powder coat. The RS-1 and RS-2 Remote System Control Panels provide a simple way to control AC equipment from one or more locations, using only inexpensive lowvoltage wiring.The panels can be easily installed in a single gang switchbox with a minimum depth of 1.5". Features common to both models include a locking key switch and a “System On” indicator LED. The RS-2 includes a momentary “Start ON/OFF Sequence” pushbutton, while the RS-1 is a maintained contact version. The rear of the panels have a circuit board with a full size barrier strip for field wiring connections.The RS-1 and RS-2 can be used to control the Furman ASD-120 Sequenced Power Distro, the PowerLink, PowerPort Remote AC Controller, the MiniPort Power Relay series, or th PS-8R or PS-PRO Power Sequencers, as well as other equipment that needs a switch contact at a remote location.